We really like helping folks prepare for their wedding! We understand how critical the wedding rings are for them, and that's why we offer so many services to help get those rings just right. First, you need to select the style. 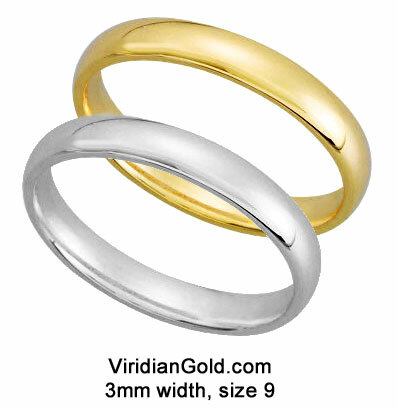 Viridian Gold offers several styles of traditional and religious rings, many of which you will not find anywhere else on the Internet! Most of these styles can be customized with a particular size and quality of diamond for the engagement ring, and we can help you with that decision. Second, rings have to be sized--we can size in 1/4 size increments from the smallest to the largest fingers. Even though the average finger size is about 6 or 7 for a woman, and 10 or 11 for a man, we have had customers who had the exact same finger size (size 6) for both the man and woman! And, just today we had an order for a man's ring in size 7. So, "non-average" sizes are not unusual! 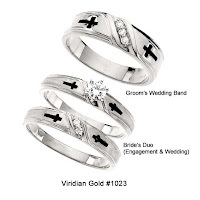 After those two big decisions, some folks might want to modify one of our religious wedding ring sets (such as #1023 above) that features recessed black enamel crosses by removing the black accent, so that the ring is all gold. The crosses are still there, they are just not as pronounced. We offer the option, for an additional fee, of shipping the rings to you without the black accents on the crosses. And, if the engagement ring includes a petite matching wedding band, such as our 1/4Ct. 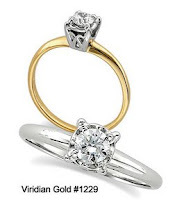 Diamond Cross Wedding Ring Set #1381 (shown to the right), for a small fee we can attach the two rings together so that they are more comfortable and convenient to wear. 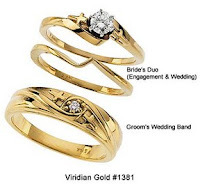 Some bridal sets have an interlocking design, and some are just "matched" (like the ones shown), but either way, you can have the rings joined. And, finally, we can help our customer get the rings on-time! It always helps us to know when you actually need the rings, so that we know if you are in a time-crunch. But, for a good rule-of-thumb, don't wait till the last minute to order your rings! Give yourself and us a comfortable margin of error so that if your order encounters an unexpected delay, it will not affect your wedding plans. A good rule-of-thumb is to order your rings about 40-60 days before the wedding date. But, if you are in a hurry, please let us know and we can advise you as to how to best make your deadline!